The witching hour (or week…as it is) has arrived. 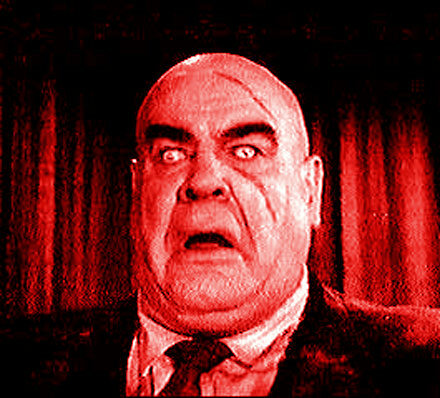 Halloween is right around the corner, and I have some rollicking, slightly morbid garage wax for you to stuff in your ears. Way back in the day, I wrote up one of the early versions of this tune (not the OG) by the Gentrys. When that one came out in 1966, it was called ‘Don’t Send Me No Flowers’, and it was a cover of a record by another Memphis garage band, the Breakers. The record I bring you today, rather boldy stolen, retitled and waxed by a crew calling themselves the What-Knots is groovy indeed. 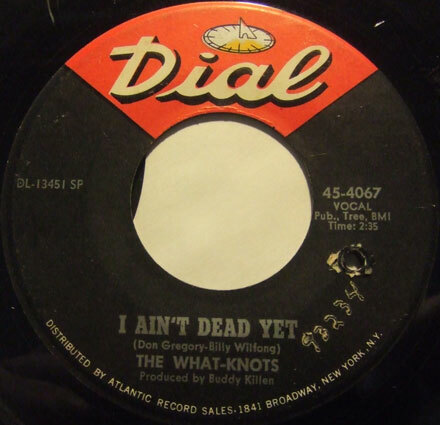 My guess (going by the style of the record and the Buddy Killen production credit) is that the What-Knots were also from the south somewhere, but I can’t say for sure, since they are pretty obscure, even for a garage band. It is of course possible that 45 years hence (this dropped in 1967) the What-Knots are still hiding from the Breakers’ lawyers, but you never know. That said, their version of the song is a hopped up bit of southern/frat rock garage, with a singer that sounds in the breaks like the inspiration for James Brown’s Hot Tub Party. I’m still not sure what he’s saying in a couple of places. The combo organ and the honking sax-o-ma-phone are top notch, as is the thick, soup bass that threatens to overwhelm the whole affair. It’s the kind of garage record that could only be made south of the Mason-Dixon line by a pack of likkered up snotballs, and for that we are all thankful. The tune I bring you today was one of those nice surprises you happen upon when you spend a lot of time digging around in records. I should start by saying that though I didn’t know this particular record, the song on it was already a favorite of mine via the stunning version by Los Bravos. 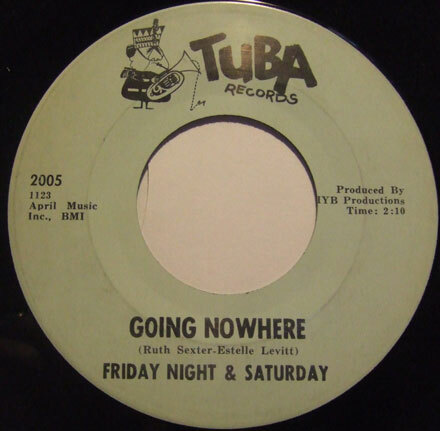 The small, Detroit-based Tuba label was of interest to me, mainly for its soul and funk offerings by artists like Derek Martin, Johnny Lytle and Richard’s People. I had surmised – after seeing a Tuba discography – that their offerings were probably not exclusively soulful. Though I have not managed to track down copies of many of these 45s (there were only 15 of them, and a couple of LPs) I did manage to pick up the record you see before you today, via a friend’s sale list. It was only after the record made its way to me via the US postal service and I had a chance to listen to it that I discovered that it was in fact the same song as recorded by Los Bravos. Once I realized that, I finally took the time to peruse the writing credits and discovered that ‘Going Nowhere’ was in fact written by two Americans, Estelle Levitt and Ruth Sexter. Though I haven’t been able to locate any biographical information on either of the composers, tracking down their songwriting credits reveals that they both seem to have been active in pop music circles in the 50s and 60s, having had songs recorded by Frankie Avalon, Herman’s Hermits, Lulu (Levitt co-wrote the amazing ‘Love Loves to love Love’), the Seekers and others. My educated guess is that Levitt and Sexter were likely working out of New York (as was producer Lou Stallman) and since Tuba picked up some of it’s masters from the East Coast I’ll go ahead and assume that the group Friday Night & Saturday (about whom I have been able to discover nothing) were too. Their version of the song (which appears to be the original, having been released a year before the Los Bravos version) is taken at a much slower pace, and with a singer who’s delivery is decidedly uninspiring, especially when compared to Los Bravos singer Mike Kogel. The arrangement of the Friday Night & Saturday version is centered around an almost surf-y guitar, heavily reverbed/tremeloed and the whole thing is delivered in a different key (maybe changed by Los Bravos to accommodate the higher range of their singer). The end result tends toward the garage end of the spectrum, whereas Los Bravos managed to turn the tune into a Freakbeat classic. It is an interesting artifact, and I hope you dig it. It’s time once again for the Iron Leg Radio Show, our eighteenth episode! This month’s show is – thanks to a very fruitful day at the Allentown All-45 record Show – packed with recent acquisitions. This time out we start with a tribute to Joe South, moving on to lots of excellent garage, folk rock , sunshine pop and as always a few wild cards. I hope you dig it, and I’ll be back next week with something groovy. The song I have for you today recently fell through the old ear-slot in a rather unusual manner. Over the course of a few days – always in another room – I heard the strains of a very interesting song playing in a TV commercial, never enough to provide any solid info, but just enough to tickle the pleasure centers of the brain. So, the third time I yell to my lovely wife – who happened to be actually watching the TV – and asked what the commercial was for. “Target, eh?” says me to my own self, all the while tapping characters into a search engine already idling at the curb. 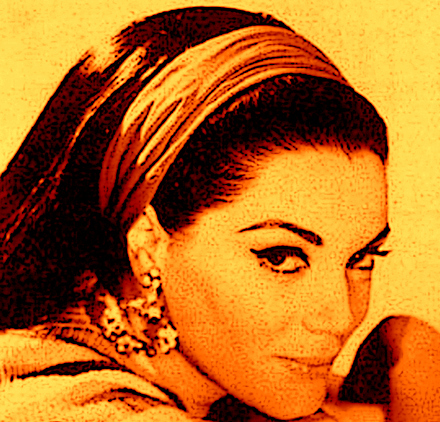 My intial forays onto the intertubes were for naught, but then I actually saw the commercial myself, picked up enough of the lyrics to flesh out the search and before long I find out that the singer of said song was none other than Connie Francis. Yes, teen queen Connie Francis, of the ‘Stupid Cupid’ and ‘Everybody’s Somebody’s Fool’ and ‘Who’s Sorry Now’, the only song of hers known to catch my ear, and only then because it’s playing in the background as Babs Jansen betrays Mandy Pepperidge to Greg Marmalard, who then leaves to administer a beating to Eric Stratton (you’ve seen Animal House, right?). I mean, to be honest, the pop-end of the early “rock” scene never had a lot of appeal to me, with Connie Francis (among others) lodged in my brain as the soundtrack to a generation that was still scuffing their saddle shoes a few years before I was born. Now, I realize that there’s a lot of groovy stuff out there that I haven’t explored in depth (for good reason), so spare me your lectures about “high school pop”, “teeners” or whatever sub-genre record collectors are jet-puffing up this week like so many marshmallows. That said, I am able to recognize when the folks extruding product from the pop factories of the day accidentally struck gold, and this is one of those instances. Miss Francis was an undeniably gifted singer, and she had a decade long run on the charts before the evolution of pop music and the cruelty of life interfered and pushed her off the rails. When she recorded ‘Fallin’’ in 1958, she had already hit with ‘Who’s Sorry Now’ and ‘Stupid Cupid’. ‘Fallin’, which was written by Neil Sedaka* and Howard Greenfield has the sound not of a New Jersey heart-on-her-sleeve balladeer, but rather something closer to Wanda Jackson (who would record the song – not nearly as well – later that same year). The song is driven by a deep, twangy, reverbed guitar, sounding like some hopped up greaser got lost on his way to Memphis and thought he might be able to pick up a couple of dollars in a New York studio. Francis herself was never sexier, purring and yelping like a hillbilly out for a night of sin. 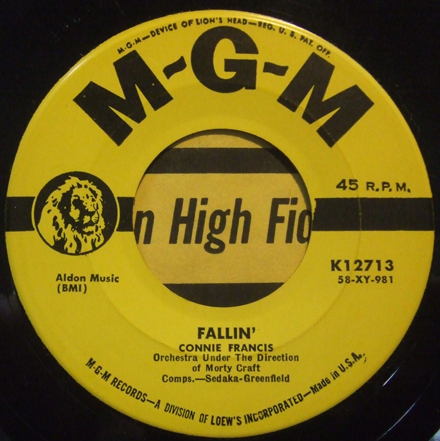 Naturally, despite hitting in some regional markets, ‘Fallin’’ wasn’t remotely as successful as her first two hits, peaking in the Fall of 1958. She wouldn’t hit big again until the spring of the following year with ‘Lipstick On Your Collar’. It was however a Top 20 hit in the UK. It’s a very cool record, and I hope you dig it. *Sedaka recorded his own version of ‘Fallin’’ in 1959, which fails to rise to the level of Francis’s for a variety of reasons, not the least of which were his voice and the arrangement.